Toshiba’s Digital Products Division (DPD), a division of Toshiba America Information Systems, Inc., today announced an all new level of 3D Smart TV for 2012. Featuring a full suite of new capabilities including ePortal, MediaGuide, Open Browser, SearchAll, MediaShare, Send & Play, eManual, Tablet Remote App Capability (TRAC), built-in Wi-Fi® and the dual core CQ Engine™, Toshiba is changing the Smart TV experience. Consumers don’t just want a good Smart TV, they want a seamless Smart TV experience. Toshiba’s new ePortal makes it easy to find and control all elements of the system. The built-in MediaGuide, featuring Rovi data, provides detailed program metadata for unmatched content discovery and organization. SearchAll allows consumers to enter any keyword and automatically search TV channels, streaming video and the home network for related content. Open Browser gives users access virtually any website and then create bookmarks for favorites. And, eManual puts the owner’s manual on screen for quick access to possible questions. Toshiba’s new Smart TVs include a new level of interoperability with other network-enabled devices in the home. MediaShare is a simple graphic DLNA® interface that allows the Smart TV to easily access and stream videos, music and photos from other home network devices. TRAC ensures that Toshiba Smart TVs are fully compatible with Android™-based devices. Used in conjunction with a free Toshiba Remote app that will be available in the Android Market, TRAC takes advantage of the full IR code library and IR blaster built into the TV, to provide unique total A/V system control. At the push of a button, the Send&Play app makes it simple to wirelessly share web-based content from a Toshiba Tablet on to Toshiba’s Smart TVs via the web browser on the TV. Both Toshiba 3D Smart TV Series move to an all-new level of power with the dual core CQ (Cinema Quality) Engine. This 1GHz dual core ARM processor creates superior picture quality with enhanced brightness, sharpness, color saturation and sharpness. In addition, the added power of the CQ Engine ensures a robust smart TV experience with additional connectivity features and increased speed. Toshiba utilizes Passive 3D Technology1 to create a fully immersive and comfortable 3D experience. With Passive 3D, consumers can enjoy hours of quality 3D without concerns about bulkier battery operated glasses that need recharging. In addition, with TriVector 2D to 3D Conversion, consumers can watch movies and TV in 3D, and even play standard video games in 3D, all the time. In addition, the TVs come with four pairs of passive 3D glasses. •L7200 Series: For those looking for the best possible experience, Toshiba’s premium L7200 Cinema Series LED Smart 3D TV takes cosmetic design, picture quality and connectivity to all new levels. 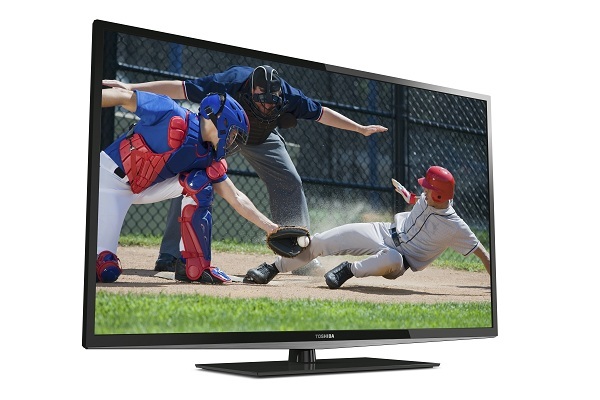 Full HD 1080p resolution high-quality panels ensure amazing 2D and 3D picture quality and detail, while ClearScan™ 240Hz technology minimizes blurring in fast motion video and Local Dimming provides deep contrast. In addition, L7200 Cinema Series includes two-way ported speakers enhanced by the Audyssey® Premium Suite, which creates deeper bass and blocks distortion at louder volumes, while equalizing the softest and loudest sounds to the dynamic range of the audio system. The TVs also feature Toshiba’s first-ever Aero™ bezel-less design, bringing the picture right to the edge of the glass for an amazing viewing experience as well as an elegant black glass table stand. The L7200 Cinema Series features a full host of connectivity options including 4 HDMI ports, two USB video ports and an HD PC input. The Smart TV also comes with a full-size wireless keyboard for easy web navigation. The L7200 Cinema Series will be available in 47- and 55-inch class screen sizes. •L6200 Series: The combination of Toshiba’s Aero bezel-less design, immersive passive 3D, and robust Smart TV capabilities makes the L6200 Series hard to beat. The Smart 3D TVs feature 1080p Full HD panels with ClearScan 120Hz technology for great picture quality and detail and the Audyssey premium sound enhancement suite for increased bass and improved sound clarity. The L6200 Series will be available in 42-, 47- and 55-inch class screen sizes. The Toshiba L7200 Cinema Series and L6200 3D Smart TVs will be available in March 2012. Pricing will be unveiled closer to availability. Both products will be sold at major retailers, e-tailers and direct from Toshiba at ToshibaDirect.com.